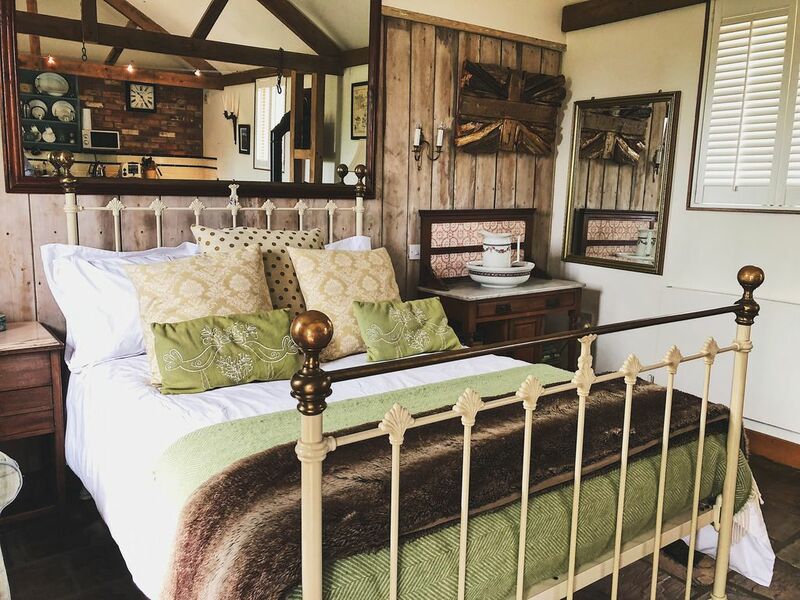 The Cider Room is a cosy studio style barn conversion tastefully decorated using a mix of bygone era luxury and modern comfort, with log burning stove and central heating. We use only the finest quality linen and soft furnishings to ensure your stay is comfortable. With outstanding views across the tranquil countryside we guarantee your stay will be relaxing. The Cider room is a one level studio, with beams and stone floor throughout, with double bed, lounge, kitchen and dining areas, walk in shower with toilet and basin. Gas fired central heating, and a wood burning stove. A laundry service available. Outside there is a patio with furniture, parking for 2 cars, storage available for bicycles. Beautiful views of the countryside an ideal place for couples to stay and relax. All linen and towels are included, and the kitchen is well equipped. On the outskirts of Bridport, 3 miles from the heritage coast, the newly converted single storey barn studio, is located on a small working farm, with beautiful views and ideally situated to explore Dorset. Your studio will consist of a large comfortable bed, ample storage space and a fully equipped kitchen. You will have a chesterfield style sofa from which to enjoy the cosy log burning stove with the addition of a modern bathroom with shower over bath and complimentary toiletries. The Cider Room has it's own private patio from which you can gaze in awe at the beautiful surrounding countryside. Outbuildings at Broad Road Farm are set in the in the heart of West Dorset, an Area of Outstanding Natural Beauty, with many exciting countryside or Jurassic coast walks. We are a 5 minute drive from the market town of Bridport and a 10 minute drive from the historic harbour of West Bay, where you will find countless pubs and restaurants providing the best in local food ad drink. High quality bathroom is fully tiled with under sink cupboard. laundry service available. Safe storage for bicycles, and off road parking for 2 cars. No extra cost for gas or electricity. Welcome pack on arrival. Ideally situated and a great base for exploring the local area and beyond. A clean well-equipped space giving you the option of self/catering because all the equipment is there or to eat out at the numerous restaurants, cafés and pubs situated within a short distance by car. Though near a road, the property is well insulated and you cannot hear it. There’s a great outdoor space and you can even get a few laps in around the fields if you fancy an early morning jog or just sit out and enjoy watching the sun rise. A few added touches like eggs, milk and cake which Karen provided added to the overall experience. We would recommend and Karen was great to converse with and extremely helpful. We love staying here. This is our 3rd visit. A lovely cosy accommodation with wood burning stove. Set in beautiful countryside. Fantastic find! Clean, comfortable and very well appointed! Thank you ! We had a really lovely stay here whilst discovering the wonders of Dorset. Fresh eggs, a homemade cake and pint of milk greeted us and were very much appreciated, as well as tea, coffee etc. Beautiful studio which was spotless and very well appointed. Lovely view across fields with sheep and lambs which kept us amused. Plenty of logs for the fab little log burner which we thoroughly enjoyed when returning from our days out. I can’t praise it enough. Thank you very much! What a wonder cosy nest, a real home from home. Just right for a short break. Stayed for just 2 nights, very well appointed property. Spotless and all in very presentable condition. Well placed for beaches and countryside. Nice welcome pack. Was met on arrival and shown around. Nice bonus of new born lamb on the farm. Only thing missing is Wi-fi. Would not hesitate to recommend this lovely property. Dorset famous for its Jurassic Coast a world heritage site, dramatic cliffs and stunning views, has a wealth of attractions and activities for visitors. It is enjoyed by walkers with miles of coastal paths and National Trust Land. Available in the local area golf courses, fossiling, sailing, boat trips, clay shooting, course and sea fishing. Interesting places to visit include Eggerdon Hill with one of the best hill forts in Dorset. The village of Abbotsbury renowned for its swannery, tropical gardens and the outstanding Chesil Beach. Bridport market town with a monthly farmers market, vintage and street market held every wednesday and Saturday offering locally produced food and seafood. Lyme Regis for its award winning winery and beautiful Harbour. Nearby beaches are West Bay, Seatown, Charmouth, Burton Bradstock and Lyme Regis. 2012 the Olympic sailing is being held at Weymouth which is 35km away. When booking is made a non refundable deposit is due (30% of your holiday cost or total cost if less than 6 weeks before holiday commences) The remaining amount is due 6 weeks before holiday commences. This property is not available for 1 night bookings. Dogs are welcome by arrangement at £5.00 per night, but are not allowed on the furnitue.